The Vanco HDSW4K31 3×1 switch is HDCP 2.2 compliant, allows three HDMI sources to be switched to one display, and requires no external power supply, which makes for an easy and simplified installation. Supporting 4K@60Hz and 4:4:4 Chroma subsampling, HRD10 and Dolby Vision and Consumer Electronic Control (CEC) pass-through, the HDSW4K31 is a multi-purpose accessory adding value to integrator tool kits. EVEXKVM2 supports up to 3840 x 2160 @ 60Hz resolutions, LPCM, DTS and Dolby Digital audio formats, and extends USB 2.0 high speed at 480Mbps to 164ft/50m. The RX (receiving) unit provides 2 USB 2.0 high speed ports at the display end and the TX (transmitting) unit provides a single USB port for connection to computers and other devices, with the ability to simultaneously charge devices. 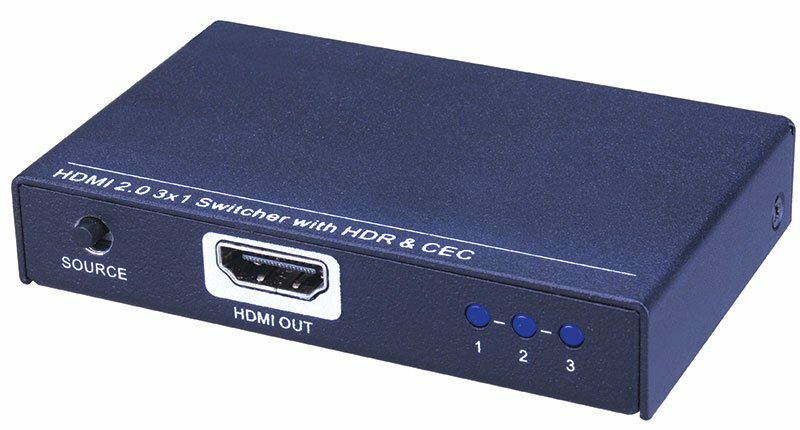 EVEXKVM2 also provides bi-directional wide band IR at 20-60kHz, HDBaseT 2.0 with CEC Support, and is compatible HDMI 2.0*/DVI 1.0 as well as HDCP 2.2/1.4.